Recorded in several spellings including Harkes, Harkess, Harcus, Hercus and Herkess, this most interesting surname is Scottish. It is of locational origin from a place called Harcarse, in the parish of Fogo in Berwickshire, Scotland. The place name is of uncertain meaning. It is first recorded in the year 1200 as Harkarres and in 1328 as Harcarres. 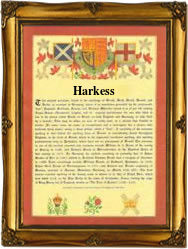 Harkes and Harkess are generally recorded in south east Scotland, whilat Herkess, Hercus and Harcus, it is said, were widespread in Orkney. Locational names were originally given as a means of identification to those who left their village or place of origin to settle elsewhere. The surname first appears in records in Scotland in the early 13th Century (see below). Alan de Harekare, distrained from debt in 1254, may be the Sir Alan de Harecares who witnessed a gift of land in Aython to the monks of Coldinghain 1259 and the Alan de Harecarr who witnessed a charter by Patrick, third earl of Dunbar in 1259. Marjorie, Roger and Thomas de Harkars, all of Berwickshire, rendered homage in 1296. Ann Herkes, daughter of John and Mary Herkes, was christened on March 11th 1777 at St. Martin in the Fields, Westminster, while Alexander, son of Robert and Elspith Herks was christened on January 22nd 1856 at Whitsome and Hilton, Berwick. The first recorded spelling of the family name is shown to be that of Adam de Harcarres, which was dated 1216, who was elected abbot of Newbottle, (Neubotle Abbey Records), during the reign of King Alexander 11nd of Scotland", 1214-1249.